In order to understand the situation, it’s necessary to grasp the geopolitical balance of power. The Huthis are a Shiite militant group supported by Iran, which in 2014-2015 gradually took control of most of north Yemen, including its capital, and made inroads into South Yemen. Their ascent to power has been seen in Saudi Arabia and other Arab countries as an anti-constitutional coup. In March 2015, Yemen’s de jure President Abd Rabbuh Mansur Hadi, who is recognized by the United States and its allies, settled in Aden (South Yemen) and proclaimed it the country’s provisional capital. The opposing Huthi forces focused their efforts on taking this major port city. During the Huthi attack, Saudi Arabia began to build up its military forces along its border with Yemen. The Huthis’ leader Muhammad Ali al-Houthi said his troops would respond forcefully to any aggressive move on the part of the Saudis and not stop until they’d captured Riyadh, the capital of Saudi Arabia. On March 25th, 2015 the country’s Minister of Foreign Affairs Hadi Riyad Yassin, appointed by President Hadi, addressed the Arabian monarchies, officially requesting military assistance from the Gulf Cooperation Council (a regional alliance comprising Saudi Arabia, Bahrain, Kuwait, Oman, Qatar, and the United Arab Emirates) via their military wing - the Peninsula Shield Force, amid reports that Hadi had fled Aden. Ten countries agreed to participate in the intervention directed against the Huthis. Saudi Arabia committed 100 fighter jets and 150,000 soldiers to the Yemen conflict. Other countries expressed their readiness to provide military aircraft, including the United Arab Emirates (30 fighters), Kuwait (15), Bahrain (15), Qatar (10) and Jordan (6). In addition, Egypt and Pakistan are participating in the campaign, and have sent naval and air force units to Yemen. Egypt, Pakistan, Jordan and Sudan have expressed their willingness to allocate ground troops to the fight against the Huthi contingents. Generally speaking, contemporary Yemen is atypical for the area, perhaps because it is the only country in the Arabian Peninsula not to have significant oil and gas deposits on its territory. While the wealth of its Arab neighbors has come to rival that of European countries, the residents of Yemen struggle with an average per capita income of $1,473 USD annually, according to 2013 World Bank data. For more than a century, the country was divided into northern and southern parts, which only reunited in 1990. During the Cold War it was assumed that the division of Yemen had followed the classic format of Soviet and US spheres of influence: those in power in South Yemen were allies of Moscow, and the North was allied with Washington. However, now it is clear that the existence of two states can be explained by much more fundamental geopolitical and religious reasons. Northwest Yemen is inhabited mainly by Shiites – practitioners of one of the two main branches of Islam. Non-Arab Iran is considered the hub of this denomination. The south and east of the country, however, is inhabited by Sunni Muslims, who have more in common in terms of their religious beliefs with the other Arab countries and with Egypt. Immediately after Yemeni reunification it seemed that these contradictions could be resolved – many predicted that the united country’s economy would boom as economies had elsewhere in the peninsula. During the first Gulf War, Kuwaiti and Iraqi oil had disappeared from the market, and even the limited resources of Yemen were in demand. However, this fragile glimmer of hope didn’t last; irreconcilable differences led to civil war in the country in 1994. Riyadh clearly did not like the prospect of a Shiite state on its border (it is already situated across the Persian Gulf from Shiite Iran - the only country in the region that could oppose it militarily). In addition, Iran’s revolution, in which a pro-American monarch was deposed and replaced with a theocratic Islamic republic, represented a clear threat to the Saudi leadership. As a result, the Huthis, who lack warplanes, were pushed back from Aden by the pan-Arab force, and the conflict has gripped the region, which fears a full-fledged war. 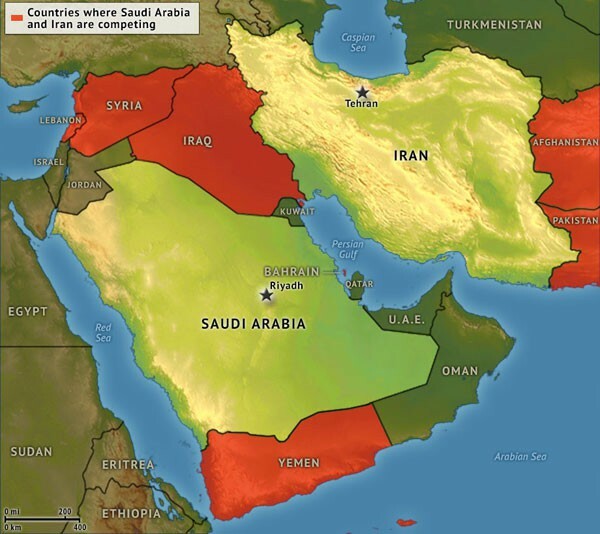 Relations between Saudi Arabia and Iran have never been close; the two largest countries in the region are constantly competing with each other. If a few years ago it seemed that Iran was losing ground, recently things have changed. If the emergence of the Islamic State in Syria led to the weakening of Iranian ally Bashar al-Assad, in Iraq the opposite was true: there ISIL militants managed to take and control most of the territory north of Baghdad, the part of the country which is inhabited by Sunnis. Now the Iraqi government controls only Baghdad and the southern areas of the country. These are inhabited mainly by Shiites - that is, if Iraq hasn’t yet become a satellite of Iran, is on its way to achieving this status. In particular, this explains why Iraq, which until recently was occupied by the United States, readily agreed to cooperate with Russia when Moscow decided to launch a military campaign in Syria. Thus, Iran has built along the northern border of Saudi Arabia an almost unbroken chain of allied regimes, from the Persian Gulf to the Mediterranean Sea. The war in Yemen has given Iran a chance to increase its influence south of Saudi Arabia. It is not known whether Riyadh is assessing the matter in terms of geopolitics, but it is unlikely that the ruling dynasty likes the situation. One thing is clear: if Riyadh and Tehran don’t decide to put an end to the crisis in Yemen, it will serve as a great excuse for a full-scale war to erupt between the two regional powers. Such a war in the Persian Gulf is likely to disrupt the supply of oil to the world market, add to growing instability in the world, and result in tens of thousands of additional deaths. Given this background, the news that the Saudis are ready for negotiations looks promising. It is possible that this is caused by the recent failures of the coalition forces in Yemen. On September 28, coalition aircraft bombed a large tent where people had gathered to celebrate a wedding, leaving 131 dead. This weekend, the Saudi air force mistakenly attacked the troops of President Hadi, killing 30 people and leaving another 40 injured. Of course, since the beginning of the conflict in the country of 25 million people, 5,400 people have been killed, but more importantly for the House of Saud, the reputation of the Royal Armed Forces of Saudi Arabia is suffering due to the civilian death toll. Why invest in the development of the army at a cost of billions of dollars and purchase the latest arms from the United States if the pilots aren’t able to distinguish between enemy combatants and wedding guests?